David Maslanka is one of the most important composers of wind ensemble music. Few others have produced such an amazing volume of incredible works. His music is a delight for the audience, a treat for musicians to perform, and makes an exciting recording. I get butterflies in my stomach when I see a work of his on the recording schedule. He uses the full range of sonorities, colors, and dynamics of an often-expanded complement of instruments. Recording his music accurately while keeping the excitement and energy of the wind ensemble is difficult because of the wide compass of dynamic contrast and instrument frequencies, colors, and textures. His Symphony No. 4 starts with a quiet solo horn and ends at the loudest possible volume with the full ensemble. As though that were not enough, wind ensembles are inherently one of the most difficult groups to record accurately. An engineer who wishes to create the best possible recording needs to first be intimately familiar with the wind ensemble as a medium as well as with Maslanka’s music. There are major differences between recording different acoustic instruments and the voice. With strings and the human voice, the sound created tends to come out and up. A group made primarily of wind instruments creates a very different field of sound. Woodwinds tend to reflect off the floor. Trumpets and trombones are strongly directional. Horns, euphoniums, and tubas are indirect. Percussion instruments can be directional, omnidirectional or both. This combination easily creates a potentially-cacophonous mix of direct and indirect sounds. Our challenge as engineers is to combine, merge, and blend these vastly different-sounding and sound field creating instruments into an accurate, natural, and pleasing end product while keeping the energy and excitement of the group as a whole. To record an orchestra, wind band or choir, we would most likely start with an “ORTF” or “XY” center pair with complimentary outside microphones before we decide where to place our highlights. To capture the sound of an orchestra, we place microphones in front of the ensemble. We also highlight the oboe, clarinet, and necessary woodwinds. We hang microphones to capture the rising sounds of the strings and put sound shields in front of the brass. We may need microphones for the percussion section. For the recording, the engineer and producer often “re-mix” the sound field to create a balanced recording. We rarely ask the orchestra members to change the way they perform with regard to their surroundings for performance. With the wind ensemble, we use microphones across the front, but we cannot place highlight mics in front of the oboe, clarinet, or flutes. Hanging microphones are not particularly useful, as the sound energy travels out of the wind ensemble and into the hall, not up from the instruments and out to the hall. You can easily discern a recording made with hanging microphones from a recording made using floor stands. With hanging microphones (if too high) it will make the listener will feel like they are floating above the ensemble, not in front of it. We as engineers cannot as successfully composite a recording of a wind ensemble with multiple microphones like we can with an orchestra. We need to rely on proper positioning of instruments, the director to balance the ensemble, and the ensemble to know the music well enough to self-balance. Brass players should not play “orchestrally” unless the music demands it. They must be keenly aware of their surroundings and pay close attention to both the dynamic markings on the page and how they blend and fit in with the ensemble. Woodwinds must adjust their balance with the sound of the brass and percussion behind them. Percussionists can dominate the sound field. Keeping their sound in control is a constant challenge. Working with the director to achieve balance and blend is essential as they are responsible for much of the final sound of the recording. In addition to the balance, timbre, and blending challenges, wind ensembles rarely play in surroundings that are complimentary to them. Performances occur in halls and auditoriums that are chiefly designed for orchestras. Reflections, reverberation trails, as well as stage and hall acoustics are usually designed for strings and indirect sounds, not necessarily for directional instruments. Luckily, many new halls have adjustable acoustic panels, but those are the exception. When recording a wind ensemble, we must often change the acoustics on the stage as well as the hall to flatter the medium. The engineer and producer need to decide how the music should sound in the end. Should it be a “homogenized sound” – a level, even wall of sound? Or should it be more “aggressive” – where each instrument and its position has a purposeful location in the stereo image? Orchestral music tends to be recorded with a more spacious and reverberant end product in mind. Sonically, the listener is often placed halfway in the hall. It makes us feel as if we are listening to an even, level blanket of sound. String instruments are characteristically homogenous and will sound different in the hall and on a recording than an ensemble composed primarily of winds. People often compliment orchestral recordings by commenting how great the “hall” sounds – meaning they are listening as much to the reverberation trail and how the music mixes within the hall as they are to the music. For wind ensembles in general and especially for Maslanka’s music, I prefer more of an aggressive, “conductor’s perspective” sound. I want to hear the placement of each instrument in the stereo image, have the colors of the instruments be vivid, be able to pick out each detail, and feel the gravelly texture of the lows. Of course, we still care about the hall with a wind ensemble. Because the group is performing in a space which was likely not designed with them in mind, we have the challenge of capturing an energetic, exciting recording as well as allowing us to enjoy a beautiful hall sound. How can we meet this challenge? My philosophy is easy to remember. I record using the KISS method: Keep It Simple, Stupid. Simple is better. Don’t complicate the music by trying to control everything. The closer you can get to a natural sound field, the better. This starts with taking your time to get a good sound check. It is paramount to achieving our goal. If we are spending days in a recording session, there should be at least an hour set aside to get the appropriate balance on the first day, then up to 30 minutes on additional days. Even if the ensemble setup doesn’t change, the room and performers will. Outdoor humidity and temperature will affect a climate-controlled hall. Individuals’ instruments and energy levels will vary subtly every day. At the sound check, we need to ensure the blend, balance, texture, and sound of each instrument is being heard and that the excitement is being captured. Changing the way the ensemble is set up on stage can help. We may place a piccolo in the brass section to achieve better balance or ask trumpets to play into their stands to control sound, for example. All of the colors and sonorities of the winds and percussion must be heard clearly in very loud sections. With an orchestra, it is common to use 20 microphones for a recording. With a wind ensemble, 6 to 8 is most common. A wind ensemble can be over-produced (unnatural-sounding) if we use the same recording techniques as we do with an orchestra. I have heard wind ensemble recordings created by high quality orchestral engineers that are amongst the worst representations of wind ensemble music ever produced. Knowing the medium matters. 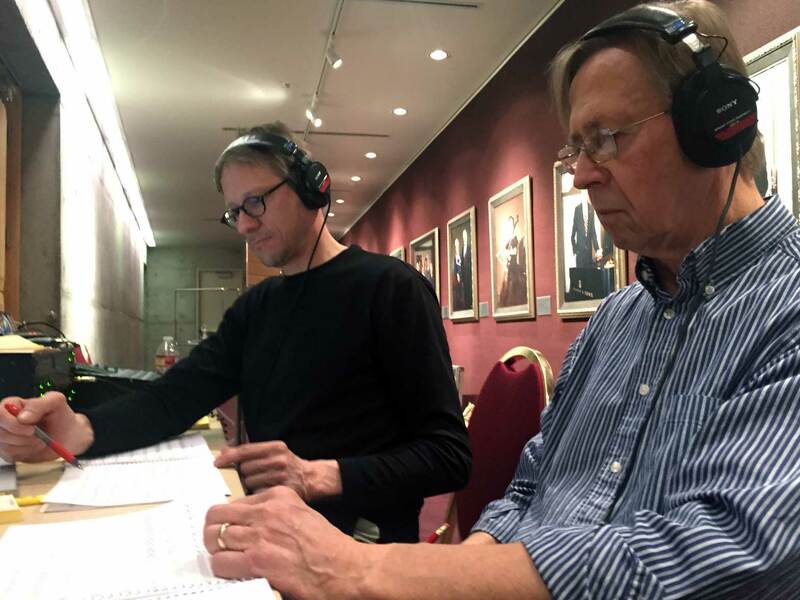 While each recording session is different and each hall and composer adds extra variables to the recording process, the KISS method is still the most effective way to record David Maslanka’s music. As with an orchestral recording, we can place a highlight microphone on the harp, celeste, and piano, ask for reflection shields for the horns but it is our duty to achieve maximum blend before the sound reaches the microphones. My goal as an engineer is to record as much of the natural sound of the ensemble as possible, with as little highlight microphone help as possible. I want to make it sound as if there were no highlight microphones at all. Engineers need to ensure they keep the organic nature of David Maslanka’s music. It is not electronic music. The music should be recorded as close to the final product as possible in the initial recording. There should be no “fix it in the editing room” mentality. This attitude leads to stark differences in instrument timbre, blend, and an inaccurate reproduction of instruments’ sounds. In Maslanka’s Symphony No. 4, for example, if the piano has a highlight microphone on it at m. 554, it is imperative that the piano sounds like it is part of the “acoustic” ensemble. It should be an accurate organic and acoustic element of the recording. The engineer’s job is to be sure the piano sounds like it is actually in the ensemble, not like a piano added on top of the ensemble. A very important note: if you are using a stereo or a single microphone for the piano, the piano should be panned properly to the natural side of the ensemble. it should not be hard-panned left and right in the stereo image. In a live performance, you do not hear the piano wide left to wide right. Also, the piano should not have an “in your face” presence. It is not the engineer’s job to re-invent, but to capture what really happens. Make sure the ensemble sounds natural, like they do live. Do not over-produce the recording. Do not be afraid to move the microphones and the ensemble around to get the proper balance. Perhaps most important: do not be afraid to experiment! I have given a few examples here, but every situation will be different. Have an idea of the sound that you want and keep striving to achieve it. Listening to David Maslanka’s music live is exhilarating! Recording David Maslanka’s music is even better. You as the engineer have the opportunity to offer the listener the unique position of being on the podium and experiencing the music the way it should be heard, from the point of maximum impact. Live, Maslanka’s music is always inspiring and exciting. With a high quality recording you can share and relive that inspiration and excitement over and over again.